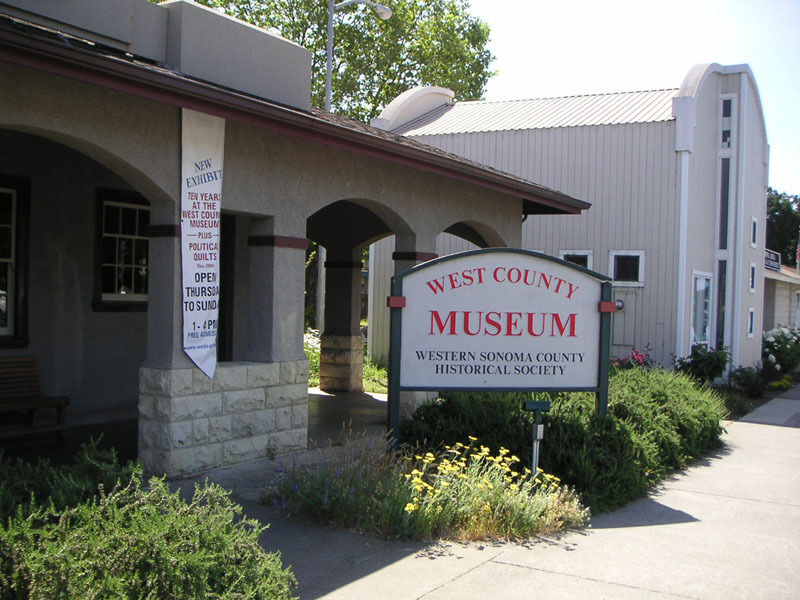 The Western Sonoma County Historical Society is a non-profit organization founded in 1974 to help preserve and maintain the unique heritage of the West County area. We are currently involved in preserving and restoring Luther Burbank's Experiment Farm, as well as mounting 2 or 3 new exhibits a year in the West County Museum located in the old downtown train station. The Society also presents annual preservation awards to those who have done an outstanding job of preserving or restoring original architecture or, in building new structures, have kept the flavor and heritage of rural Western Sonoma County. 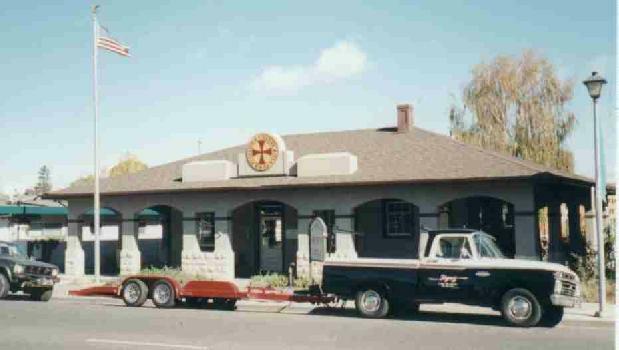 The Western Sonoma County Historical Society in cooperation with the City of Sebastopol undertook the restoration of the P&SR; Railroad Depot in the 1980s. The building had been designed by Brainerd Jones, noted Petaluma based architect. The West County Museum opened in this building in 1993 with an exhibit on the Railroad. The Depot was placed on the National Register of Historical Places in 1996. Museum exhibits are changed 2 to 3 times a year and focus on west Sonoma County history. Past exhibits have explored movies filmed in Sonoma County, historical toys, eclectic collections from the community, the World War II experience on the home front, the apple industry and apple festivals and fairs, early lighting devices, etc. The Museum features a small reference room containing historical reference books and a clippings file along with recordings of local personal histories. The museum's has interesting reproductions of Antique Button Jewelry featuring Vintage Glass Beads. There are many other souvenirs: RR caps, T-shirts, books and pamphlets, etc. On the grounds and to the south and east of the museum proper you will find a small garden with a number of Luther Burbank's plant creations. Most of these are sold every Wednesday, 9 to noon, at the farm. You'll find directions and a brochure in the museum. Admission is free. Exhibits current and former can be seen on our web page noted below. See the KIOSK for latest information. We also maintain Gold Ridge, Luther Burbank's Experiment(sic) Farm. Still extant here are some experiments he never finished as well as many he did. We also propagate various authentic Burbank varieties for sale: Shasta daisy, Spineless cactus, Burbank Strawberry, etc., etc. A major Shasta daisy collection is now well developed. Rotating: Luther Burbank memorabilia. Popular old movie theaters of Sebastopol artifacts and information. Apple country history and equipment (the area is famous for the superb Gravenstein apple). Permanent Triggs Reference Room collection available for research by appointment. Exhibits rotate according to the views of the members and officers and volunteer curators. Themes are on local or CA northcoast history. At the Gold Ridge Farm: the remainder of some of Luther Burbank's last experiments underway before his death in 1926. Authentic and appropiate Burbank varieties are still being sought nationwide for reintroduction. Gold Ridge Farm: Docent tours by appointment, April to October. Self guided tour all year long. Gold Ridge Farm: All are welcome. No admission charge; donations cheerfully accepted at all times. We provide a self guided tour map at the farm. From Hwy 12 go to middle of town, turn left on Main St. (south). Drive 'til you see the large sign out front on your left. We're opposite the U.S. Post Office. From Hwy 116 turn left on Bodega Ave. and left again in the center of town to go down So. Main St.
Go west through town up the hill on Bodega Ave. When you pass Robinson Rd. look for the sign to your left just past Nelson Way. It's in front of the Burbank Hts. Housing Development. Limited parking is in front. To get to it turn right on Nelson Way, left on Washington Ave., then left again on Virginia Ave. Go to Bodega Ave., turn left and you will see the reserved parking places on your right. Since these are few, overflow parking can be found in St. Stephen's Church parking lot. Go down the hill a block to Robinson Rd. then south to St. Stephen's. A path at the head of the lot leads through the Burbank Hts. Apts. and to the Gold Ridge Farm.